Our mission is to spread awareness for medulloblastoma and to help conquer pediatric brain cancer for the next child. About 4,600 children and teenagers are diagnosed with a primary brain or central nervous system tumor each year. That’s 13 new cases per day. 72% of young people diagnosed with a brain tumor are younger than age 15. Yet, only 4% of government funding has gone towards pediatric cancer research and less than ten drugs have been developed for pediatric cancer since 1980. So if you're arguing or protesting over things you can't change, here is one that you can change. Take action for these babies. 100% of the race proceeds will benefit the University of Florida Foundation - McKnight Brain Institute with funds restricted to the Pediatric Brain Tumor Immunotherapy Program. The McKnight Brain Institute of the University of Florida is one of the nation’s most comprehensive and technologically advanced centers devoted to discovering how the normal brain operates, and how we can repair the brain following injury, disease, or aging. According to the American Society of Clinical Oncology, immunotherapy, also called biologic therapy, is a type of cancer treatment designed to boost the body’s natural defenses to fight the cancer. It uses substances either made by the body or in a laboratory to improve or restore immune system function. While cancer immunotherapy has emerged as a highly effective approach for the treatment of several types of advanced cancers, including metastatic melanoma, advanced lung cancer and refractory lymphoma, brain cancer has remained a significant challenge due to the blood-brain barrier exclusion of many immune cells from the central nervous system and the profoundly immunosuppressive brain tumor microenvironment. The team at the McKnight Brain Institute has developed several approaches to the immunologic treatment of pediatric and adult malignant brain tumors. Given the fact that even the most effective immunotherapies to date, which have been recognized as breakthrough successes, still only achieve complete clinical responses in roughly 30 percent of treated patients, there is tremendous potential significance in tumor responsiveness to immunotherapy. For this type of immunotherapy, some T cells are removed from a patient’s blood. Then, the cells are changed in a laboratory so they have specific proteins called receptors. These receptors allow those T cells to recognize the cancer cells. The changed T cells are grown in large numbers in the laboratory and returned to the patient’s body. Once there, they seek out and destroy cancer cells. This type of therapy is called chimeric antigen receptor (CAR) T-cell therapy. Researchers are still studying this and other ways of modifying T cells to treat cancer. Currently, these treatments are only available in clinical trials. 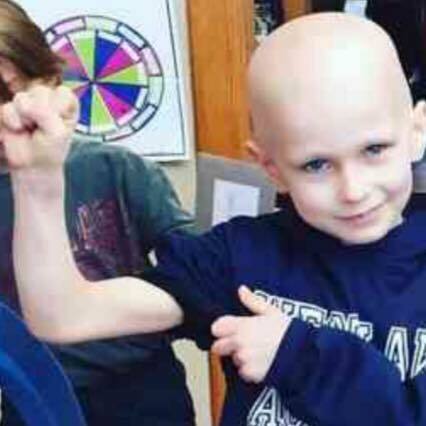 Sawyer the Fierce was an eight year old second grader at Westlake Academy when he passed away from medulloblastoma (brain cancer) peacefully on the evening of December 12, 2016. A wise, witty and amazing little boy, Sawyer was obsessed with science and how things worked. His dream was to be a scientist and a philanthropist when he grew up. Sawyer was a fierce wrestler, nerf gun aficionado, and master Lego builder. No matter what Sawyer was going through, he put up one heck of fight until he finally realized his next wrestling match would be in heaven. This is how we’ll always remember him. He didn't lose the battle, he called it, he said he wanted to go to heaven...it's not a battle if the fight isn't fair.